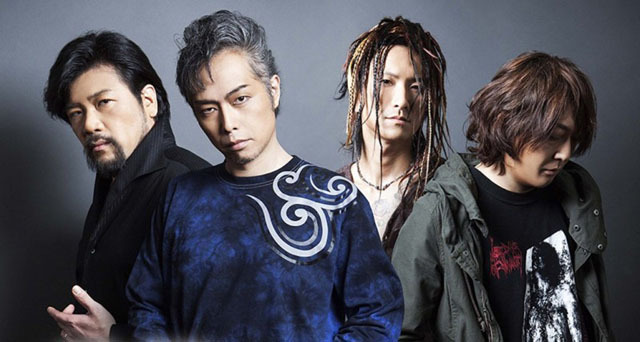 A quintet rock band formed by ex-Kiniku Shojotai member Kenji Otsuki in 2000. The other members are NARASAKI (Gt./ COALTAR OF THE DEEPERS), Satoshi Mishiba (Piano, Key), ARIMATSU (Dr.), and Yuichiro Uchida (B./ Kiniku Shojotai). After the release of their 1st album “Bakuen” in February of 2000, the band went on tour. At the end of the tour, Uchida left the band. Since then, the band has hired a support bassist to fill in the gap. In 2006, the band went on hiatus when Otsuki rejoined Kiniku Shojotai. In April 2011, the band suddenly announced a tour. In June, released the slbum “Gonengo no Sekai”. In December 2012, for the first time in 7 years, released the full-length album “Panagia no Onkei” with the original lineup.